Safety for offshore workers provides vital new line for Flameskill. Safety offshore is paramount and one Norfolk company has become a key player in protecting workers in the Southern North Sea. 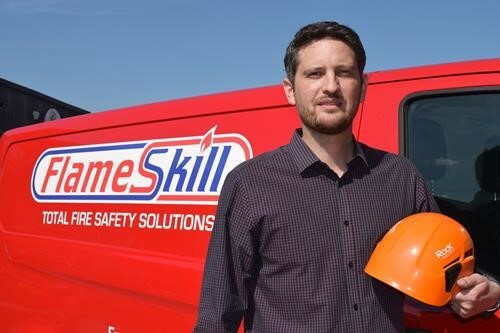 Great Yarmouth-based Flameskill was on the lookout for opportunities following a slump in the Oil & Gas sector and was contracted to hire out life-saving and other kit for the Galloper, a 350MW offshore wind farm located 30km off the Suffolk coast. The company now offers complete range of life-saving equipment off the shelf from its premises – from life jackets and immersion suits to breathing apparatus and gas detectors. While fire protection has been at its heart since Flameskill’s inception in 1988, an increasing demand for safety equipment in the Southern North Sea has opened up a whole new side to the business. Around 1,200 immersion suits were supplied to a major SNS operator in the past 18 months, along with escape equipment and the cabinets to store the equipment in. Equipment is also serviced by the company when it comes ashore. The suits were purchased as part of a ‘walk-2-work’ scheme which involves having an accommodation vessel that pulls up alongside the platform and workers walk across to the platform via a bridge. Flameskill also supplied all the fire and safety equipment for the substation platform of the Dudgeon offshore wind farm, which is situated 32km off the coast of Cromer. Kit included lifejackets, immersion suits, breathing apparatus, a defibrillator and a rescue stretcher. “Renewables is going to be here for some years,” said Sam. “We are looking at ways of getting into offshore wind and the biggest market is life-saving equipment, PLBs (personal locator beacons) and harnesses. This release has been produced by TMS Media on behalf of Flameskill. For more information, contact Richard Balls at TMS Media on 01493 662929 or Sam Monument at Flameskill on 01493 440464.